Will we be paying M5 tolls for another 30-40 years and what about Cashback, that is the question. In 1995 Bob Carr was elected premier of NSW largely off the back of a pledge to get rid of tolls on the M5 and the M4. When his Labor Government discovered that they could not legally abolish tolls, they created Cashback. Under the Cashback scheme, motorists paid the tolls but were fully reimbursed by the state government. In other words, they got their cash back. Now, 22 years later, the Labor opposition is suggesting that the Berejiklian Government will sooner or later ditch Cashback, leaving south west motorists with a massive financial burden. As part of that attack, Campbelltown MP Greg Warren launched a petition against the NSW Government’s plans to extend the toll on the M5 South West. The South West Voice pointed out that so long as Cashback remained in place and motorists were fully reimbursed, toll extensions would not be a major issue. “Cashback was not funded in the 2017-18 budget. “All signage promoting Cashback has been taken down from the motorway – is this a sign of what’s to come? “As the value of the toll and therefore the budget cost of the Cashback continues to increase every year, it will become less and less affordable for government and the temptation to abolish Cashback will be greater. Is Cashback going to be dismantled by the government? Why have Cashback signs been removed from the M5? Why is there no money in the current Budget for Cashback (as Labor claims)? We also passed these questions on to the two local Liberal MPs, Jai Rowell in Wollondilly and Chris Patterson in Camden. “The NSW Government has no plans to remove Cashback on the M5 southwest motorway. “We are cracking on with building the New M5, which will increase tunnel capacity from four lanes to eight lanes – with capacity for ten lanes in future,’’ Mr Rowell said. 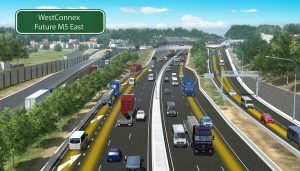 “This vital stage of WestConnex (New M5) will deliver significant benefits for current users of the M5. “It will also slash travel times by half an hour on an average peak journey between Liverpool and South Sydney. Despite the somewhat murky Cashback situation, Labor must think the tolls issue is a winner for them in south west Sydney. Petition against M5 toll extension: Anoulack Chanthivong MP (Member for Macquarie Fields), Anne Stanley (Federal Member for Werriwa), Liverpool councillor Charishma Kaliyanda, Cameron Murphy (Labor candidate for East Hills), Jodi McKay, Tania Mihailuk (Member for Bankstown), Greg Warren and Liverpool mayor Wendy Waller. 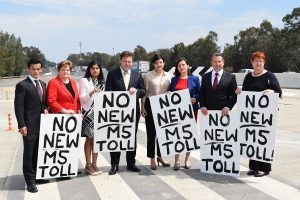 When Greg Warren launched the petition against the NSW Government’s plans to extend the toll on the M5 South West he was joined by opposition roads spokesperson Jodi McKay and a cavalcade of local Labor MPs, candidates and councillors. Mr Warren’s petition calls for the government to rule out extending the toll on the road beyond 2026. The petition comes after Mr Ayres recently revealed that the government plans on including toll rights for the M5 South West in the sale of the Sydney Motorway Corporation, which is expected to be finalised by the end of 2018. The toll on the 22 kilometre stretch of the M5 South West Motorway was due to expire at the end of 2026, when the road was paid off. However, under the government’s plan the toll could be extended into the 2060s, rising by 4 per cent or the rate of inflation every year. That means local residents will be paying tolls for an extra 30 years – assuming Cashback is also given the flick. A motorist from South West Sydney using the M5 to commute to and from work would pay $9.20 a day in tolls, which equates to $2,162 annually – before accounting for annual increases. The Labor representatives urged residents of South West Sydney to voice their opposition to the extension of toll by signing the petition, which will be tabled in Parliament. “This is yet another sneaky act by a spiteful government that’s clearly out of touch with the challenges and hardships of many local families and local small business owners in Campbelltown and Macarthur,’’ said Mr Warren during the launch of the petition. “By 2026, this road will have been paid for. Why should hardworking and frustrated motorists have to pay more than they have while getting nothing in return?